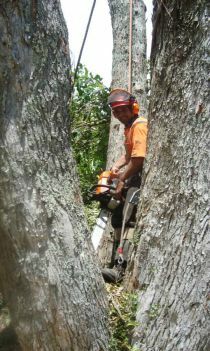 Asher and the Ash and Oak arborist tree services team all live in the Bay of Plenty, Asher emigrated here in 2008 after traveling and working in New Zealand he couldn’t wait to live in the idyllic climate. Asher also couldn’t believe the rate of vegetation and tree growth in the country and being an arborist nothing interested him more, therefore deciding to make the move and bring his tree business with him into the bay. The business has now grown since then and Asher thanks all his existing customers for their support. Ash and Oak arbroist has a large range of equipment and knowledge to help with any tree, shrub or vegetation management queries. Contact us today so you can receive a FREE quote. As well as the tree service business when Asher arrived he brought his equipment with him, part of his equipment was his Jensen Tracked Chipper, this was the first one to enter New Zealand. ALFA Contracts are now the sole importers and distributors of Jensen Wood Chippers- these chippers were new to New Zealand but the first was built in Germany in 1884 by Peter Jensen. For over 120 years, Jensen has been synonymous with quality and reliability. They are German made and distributed all over the world. Now its time for New Zealand to move up to a Jensen!